Stephen Lawrence Centre fences to go! It's not often that I am sufficiently moved to put an exclamation mark in a headline, but when I discovered that the Stephen Lawrence Charitable Trust had submitted a planning application for new landscaping around its building on Brookmill Road, and when I realised that this new landscaping includes TEARING DOWN THE FENCES, my heart sang. I've always felt that this was a woefully unfriendly building - even finding the entrance door can be a challenge - and the fencing around it makes it look more like a Northern Irish police station at the height of the Troubles than the community building it is intended to be. This may be the reason I've never been inside. I don't dislike the building itself, just the overtly unwelcoming face it offers to its neighbours. Unfortunately the building was vandalised just a week after opening in 2008; the huge wall of glass designed by Chris Ofili was smashed by bricks thrown from outside the perimeter in what was dubbed a racist attack at the time. The fences failed to prevent the attack - finally they are going to be removed and hopefully the centre will start to have a more neighbourly relationship with the local area. First phase of the centre's reinvention was this week's launch of the new 'co-working' space which featured in Wallpaper magazine. It seems that the next phase will address the poor public realm on the site itself, and its relationship with Deptford. There's not much in the way of renderings in the planning application, but the main change is going to be the removal of the steel fences and the gates, with just a low wall retained. 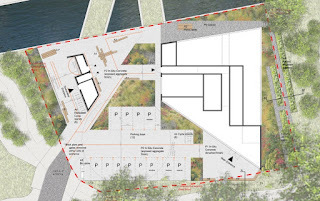 A new pedestrian route into the site will be created right in front of the building entrance, and a range of landscaping, picnic tables and raised planting will be installed within the site. On the Brookmill Park boundary there will be raised allotment beds. I look forward to getting a full length view of the magnificent windows. With Twinkle Park currently a no-go zone and work to reinstate the pond seemingly halted, comes an update from the Twinkle Park Trust. The work started was due to be completed in mid-May but unfortunately there has been a delay which has resulted in work being halted until July, at which point we will finally get our pond back! In the first few days of work, as the vegetation which had taken root over the past few years was being cleared and the contractors began to tackle the liner, they found evidence of subsidence. In the months following the draining of the pond, the Twinkle Park Trust commissioned costly scans of the pond bed to be undertaken, none of which showed any conclusive results, so to finally have found the probable explanation for the water’s disappearance was a relief, but there was obvious concern that the discovery might jeopardise the entire project. Further examination quickly followed, and a dig around the area uncovered a brick structure with a void, into which some soil had collapsed. It seems that the pond was originally built on top of an old cesspit or well, which had been disturbed (perhaps by the building or utilities works, ongoing in the area at the time), causing a degree of collapse. Following advice from a range of architects and builders, as well as consulting with the project’s funders, the Trust has been able to determine a course of action which will see the safe completion of the pond restoration. Unfortunately, owing to the delay, our contractor was forced to move on to their next scheduled job, forcing our own building work to pause. The contractors are scheduled to return as soon as possible and are now expected to return to recommence the work on 2nd July 2018. The Trust is grateful for the assistance and advice we have received from all parties involved in the project over the past few weeks, and whilst we are naturally disappointed that this unavoidable delay has occurred, we are thankful that the project has not been threatened. Whilst we recognise that it is not ideal, we are sure that the surrounding community will agree that the return of the pond to Twinkle Park will be worth the price of a couple of extra months of fences and exposed soil.